The Center for Hope and Healing provides a monthly general grief group on Mondays. Hope Hospice grief support groups provide a safe, confidential and supportive setting for anyone experiencing a loss and are led by trained facilitators. Please contact 508-957-0304 to register or for more information. 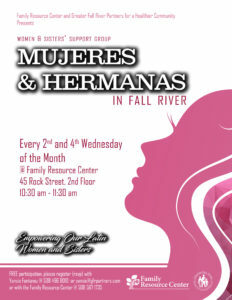 Empowering Our Latin Women and Sisters – a Support Group for Latino Women. Every 2nd and 4th Wednesday of the Month. Weekly one-on-one tutoring program for children kindergarten through 12th grade impacted by homelessness. This program is closed for referrals. Parent support group for parents engaged in the PIN program held on the 1st and 3rd Friday of every month. Please contact PIN Parent Coordinator, Chelsie Atwood for more information. Hope Dementia & Alzheimer’s Services Alan Johnson, LICSW facilitates this group held on 1st and 3rd Friday of every month. This program is specifically for people caregiving for someone with memory impairment and provides an opportunity to share experiences, receive information, guidance and support. Contact 508-775-5656 or info@HopeDementia.org to register or for more information.